Notice: As of 8/26/12, the Tropics page is being discontinued. Discussions on tropical cyclones that threaten to affect the US directly will be posted in this page. An area of showers and severe thunderstorms continued to drift north through the Mid Atlantic, while generally dry conditions continued further north. More sunshine was observed than expected, with highs reaching the lower to mid 80s from NYC and further north/west and the upper 70s to low 80s in Long Island/S CT, verifying Sunday’s temperature forecast. Although today had more sunshine than expected, more widespread clouds are expected for Monday and early Tuesday as a cold front moves through the region. Partly to mostly cloudy skies are expected for Monday with scattered thunderstorms developing north and west of NYC, mainly in the late afternoon and evening hours. 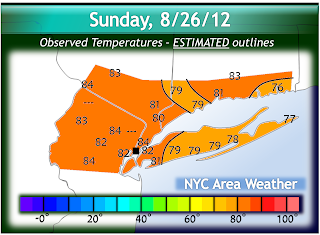 High temperatures are expected to reach the lower to mid 80s from NYC and further north/west and the upper 70s to lower 80s in Long Island/S CT. More widespread thunderstorms are expected during the overnight hours into early Tuesday as the cold front approaches, with a decreasing risk of storms by Tuesday afternoon with the front moving east and clearing skies later in the day. Temperatures are expected to be slightly warmer, in the lower to mid 80s across the area, although a few eastern areas may fail to reach 80 degrees. A trough will then move into the region, resulting in cooler temperatures for Wednesday and Thursday. Mainly sunny skies are expected for Wednesday with highs in the upper 70s to lower 80s across most of the area. With clear skies, a high pressure overhead and 850mb temps near 10C, colder temperatures are expected overnight, dropping into the low to mid 50s for most places away from NYC, with upper 50s closer to the suburbs and low to possibly mid 60s in the city. Interior areas are expected to see lows in the upper 40s to lower 50s. The cool down won’t be long lasting, however, as ridging rebuilds into the region with a WSW/W wind developing as the high pressure shifts south of the area, allowing for a brief surge of heat. The heat won’t be long lasting as well, however, as the flow remains generally progressive as well as Isaac’s remnants likely disrupting the heat surge by the weekend. Highs on Thursday are expected to reach the upper 70s to mid 80s across the area with the warmest temperatures in the immediate NYC area along with mostly sunny skies; overnight lows will not be as cool as Wednesday night, likely dropping into the mid 50s to low 60s away from NYC. The peak of the heat is expected for Friday and Saturday as the warmest air mass moves through, with 850mb temperatures approaching or reaching 20C, the first time this has happened since 7/26. 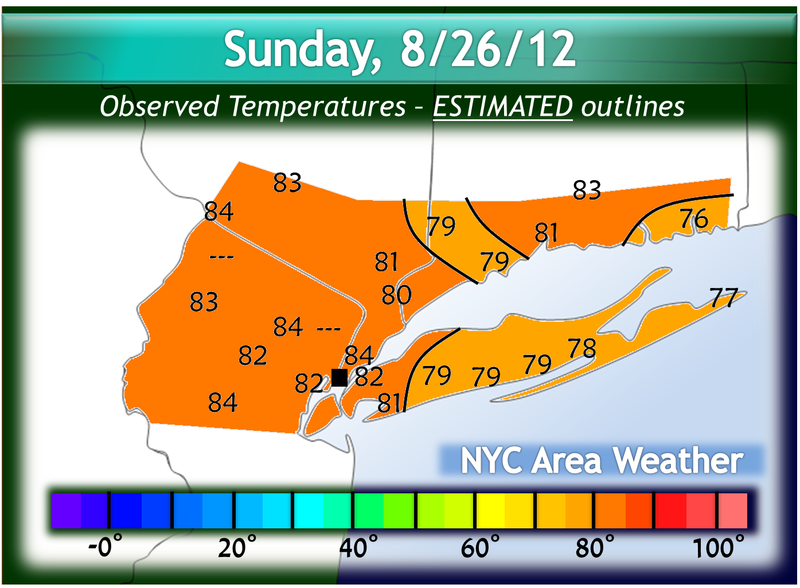 With such conditions, temperatures are expected to reach the 90s in the immediate NYC area and perhaps in other parts of the area as well. Exactly how hot temperatures end up is still somewhat uncertain, with the heat surge also depending on Isaac’s remnants and what they do once inland, although at this time low to perhaps mid 90s at most appears reasonable for a maximum temperature call, with upper 80s to low 90s more likely at this time. Afterwards, uncertainty increases as the forecast depends on what Isaac’s remnants will end up doing, although the possibility is there that the remnants may end up moving through the area with a faster speed around the late weekend into the early week. Stay tuned for more information on the heat surge and what may happen with Isaac’s remnants. Following yesterday’s update, as Isaac gradually moved further away from Cuba’s coast and into the Gulf of Mexico, it has attempted to reorganize itself and intensify. While it has noticeably improved in appearance today, Isaac once again faces a similar issue it had in the Caribbean as it lacks a solid inner core and its center is not aligned. Additionally, Isaac is also being affected by some dry air and about 10 knots of S/SW shear. The current lack of intensification may mean a slightly delayed period of intensification, although Isaac is still expected to strengthen in the Gulf of Mexico to hurricane intensity while approaching New Orleans. Isaac’s Track: Isaac continued to move in a WNW motion throughout the day while maintaining a moderately fast forward speed along with ridging still rebuilding to its north. Isaac will continue moving to the WNW/NW over the next 2 days through the eastern and north central Gulf of Mexico. There is still uncertainty regarding Isaac’s track near landfall, however, as some models have Isaac turning north while ending up east of New Orleans as a result of a weakness in the ridge, while other models show the weakness having less of an influence on Isaac, with the storm instead sticking on a NW track until making landfall in south central Louisiana. There is no certain call yet regarding the exact landfall location, although at this time I am slightly shifting my forecast track to the west, taking it closer to New Orleans, although the high confidence landfall zone is from at least the AL/MS border to south central/SW Louisiana, and the exact landfall location may still shift a bit west/east. Isaac’s Intensity: The intensity remains the complicated aspect of Isaac’s forecast, as intensification today has been slower than expected with Isaac still struggling to recover and form an inner core following land interaction 1-2 days ago. Isaac is still influenced by 10 knots of wind shear, which despite not completely inhibiting development, is not ideal for Isaac to rapidly intensify in the short term. Additionally, Isaac still does not have a solid inner core, an issue which it has had throughout its lifetime. Some positives signs for Isaac, however, include Isaac sustaining strong bursts of convection near its center, and as of the National Hurricane Center’s 8 PM update, some strengthening has taken place with sustained winds up to 65 mph and minimum pressure down to 991 mb. Given Isaac’s current difficulties, rapid intensification is not expected for the next 12 to perhaps 24 hours. 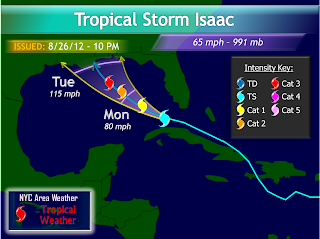 Recent observations, however, show that Isaac is slowly attempting to develop a core. For the short range, this is not likely to be a fast process although intensification is still expected to take place, especially with the sustained convection near Isaac’s center, and gradual intensification is expected through Monday, when Isaac is likely to develop into a category 1 hurricane. Afterwards, intensification depends on when Isaac can develop a core and how much it will be able to intensify. Should Isaac be able to form a solid inner core within the next 24 hours with a favorable environment for intensification along with lower shear, rapid intensification may very well be possible to strong category 2 or category 3 intensity. The possibility is still there, however, that Isaac may fail to rapidly intensify in the Gulf of Mexico, and ends up weaker at landfall, perhaps a weak category 2 hurricane. For now, I slightly reduced the maximum intensity forecast to a low end category 3 hurricane, while delaying the intensification trend, although the intensity forecast is still subject to change. It is possible I may need to readjust the forecast intensity a bit higher should Isaac organize itself and rapidly intensify later on Monday, or lower the intensity to a category 2 hurricane should Isaac continue to take more time to intensify. 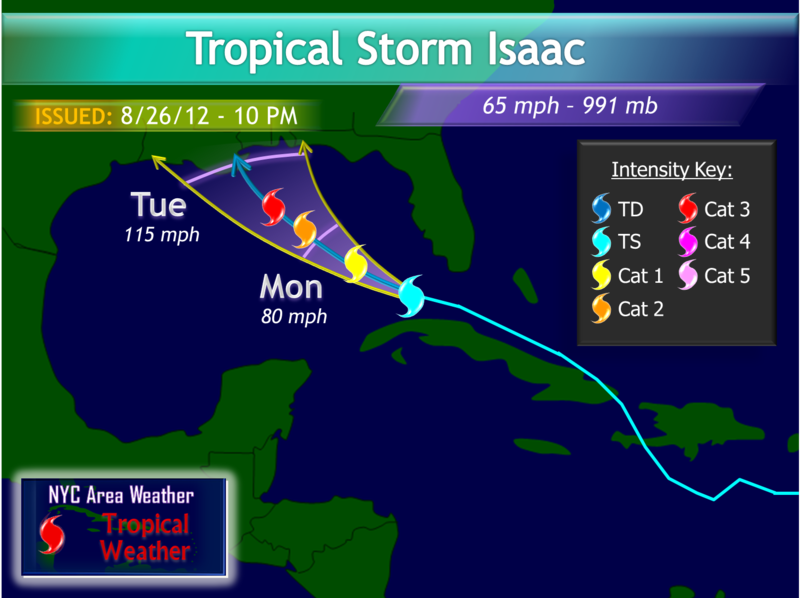 A brief update will be posted on Monday afternoon regarding Isaac and any changes to the intensity forecast. Regardless of the exact landfall location or the intensity, Isaac has the potential to be a damaging hurricane where it makes landfall, and the entire Gulf coast from western Louisiana to at least Palm City, FL, needs to keep a close eye on Isaac with a hurricane landfall likely.